As we fly into Spitsbergen, holes in the cloud below reveal a stark bare-boned landscape of peaks streaked white with the remains of last winter’s snow. In such a monochromatic scene it is hard to tell snow from cloud. After months of anticipation and preparation, we have at last arrived in Longyearbyen, ‘capital’ of the Svalbard archipelago, where smart male Snow Buntings sing from the roof tops, dozens of seasonally redundant snowmobiles still sit where they were marooned by the spring thaw and traffic signs include a warning triangle for roaming Polar Bears! Once on board the plush Plancius, we are welcomed by our expedition leader, introduced to our Russian captain and briefed on safety drill before leaving port on a northerly course around 6pm. As we sail away, followed by smoky ‘Northern’ Fulmars, there are jagged peaks breaking through the low clouds in all directions. We sit down to dinner at 7.30pm, with a green salad, roasted apple and blue cheese starter, followed by a Blue Whale on the port side bringing dinner to an abrupt halt, causing mayhem in the kitchen as people dessert the dining room for a better view out on deck! Eventually order is restored and dinner is served so that we can retire to the decks to watch several huge Blue Whales, including a mother swimming alongside her fifty ton calf! The whales repeatedly surface with loud breaths, sending a plume of spray from their bulging nostrils into the air, followed by their long arching backs with a tiny dorsal fin, while the ship sits idly by, and at one point, one of the whales passes within a hundred yards of the bow of the ship! What a fantastic start to this Arctic adventure. Whereas the land is very rugged, the sea is so calm one would not know we were on board a ship were it not for the ever changing scenery and the gentle hum from the engine room. This is only the first morning on board and yet just after breakfast a Polar Bear is spotted resting on a small island on the port side and so we drop anchor and launch the Zodiacs for a closer view. By the time the small flotilla of inflatables reaches the shore, the bear is on the move, walking slowly closer to the shore, and eventually stopping to sniff the air at eye level with us barely 100 yards away, before going for a leisurely swim between the stationary boats. Meanwhile a female Grey Phalarope in resplendent brick-red summer plumage drops in for a paddle just off the same beach as the Polar Bear! By now the bear has made it to the next island where she shakes herself off and has a roll in the snow before melting away behind the rocky skyline. Next we land at Smeerenburg or ‘blubber town’, the site of a seventeenth century Dutch whaling station where around two hundred men lived and died. All that remains now are remnants of the ovens used to render the blubber into oil, and a few Barnacle Geese. This afternoon, after sailing even further north, we land on a desserted beach, in a completely silent world apart from the occasional calls of Kittiwakes, Arctic Skuas and a single singing Snow Bunting. By 10.30pm, still in broad daylight, we are more than 80° north and steaming towards the polar ice. We awake with a sudden jolt at 7.10am as the ship meets the first chunk of sea ice, and we slowly grind our way ever northward through tightly packed ice floes floating on an inky black sea. The ship judders and rocks with a sound like distant thunder as it forces its way through an impossible to reassemble ‘jigsaw’ of floating ice, splintering into even more pieces as we steadily inch forward, with Kittiwakes following the ship and deftly swooping down to pick off finger length Polar Cod exposed by the shifting ice. The ‘Ice Bear’ eludes us today, but we do find a Bearded Seal with a long bushy moustache hauled out on an ice floe, and it remains calm and relaxed as the massive ship approaches to within 100 yards. Gradually the ship navigates through a sea of thicker and thicker ice until reaching virtually solid pack ice barely 600 miles from the North Pole, just ‘six minutes’ shy of 81° north! The sun shines brightly throughout the ‘night’ as the ship heads south into the northern end of the Hinlopen Strait between the islands of Spitsbergen to the west and Nordaustlandet to the east. By 8.30am we are in the Zodiacs for a cruise past the spectacular towering cliffs of Alkefjellet (Auk Mountain). These rocky stacks of dolerite make the Old Man of Hoy look like a midget! In summer the ledges are choc-full of Brünnich’s Guillemots in their tens of thousands while the air above also swarms with birds, like bees round a hive. Amongst the crowd we also spot Black Guillemots and marauding Glaucous Gulls. With so much chattering, flapping activity, the sights and sounds create a remarkable, almost overwhelming experience, and just as we are about to return to the ship, an Arctic Fox appears in its chocolate brown summer coat, trailing a long shaggy white tail as it speculatively patrols the lower slopes in the hope of finding a hapless nestling; an amazing morning in an amazing place. At 2.30pm “Walrus on an ice floe at one o’clock” is announced over the tannoy and as it takes to the water, it is accompanied by a tuskless baby. By now we are in ‘Bear Sound’ and true to its name there are three bears here! A mother and cub on one side and a sleeping bear on the other, so the Zodiacs are launched to get closer views of the two bears. 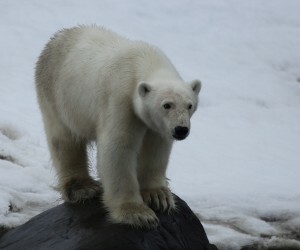 As the Zodiac flotilla slowly and quietly closes in, the eighteen month old cub ambles down the slope to meet us! Meanwhile, mother keeps a watchful eye from on high as the cub poses within thirty yards of the boat, right at the water’s edge on a boulder, just like a Fox’s Glacier Mint bear! Almost an hour flashes by as the two bears provide plenty of footage for the whirring cameras, before the youngster gets bored and wanders off back up the slope to Mom, roaring as it goes; another fantastic wildlife encounter. This morning we are unable to land on the island of Barentsøya as planned, as there are another two bears on the shore, making a total of six now seen so far! Also visible from the ship are a couple of magnificent looking Reindeer with thick hoary coats and fine sets of antlers. Moving on in search of a bear-free landing zone, bear ‘number seven’ appears, fast asleep on the tundra at nine o’clock, around 10am! By now the wind has whipped up a heavy swell, preventing any Zodiac rides today and so the ship sails south around the southernmost cape of Spitsbergen looking for calmer water, which makes it a bumpy night. It’s a beautiful calm sunny morning, in stark contrast to yesterday, with awesome glacial scenery all around, perfect for a tranquil Zodiac ride in Hornsund, where towering pointed mountains feed glaciers which meet the sea as cliffs of ice over 100 feet high! This is a silent place except for the calls of hundreds of Kittiwakes, resting on the ice floes, and the occasional loud crack of ‘thunder’ each time a large chunk of ice calves from the cliff face. Amongst the ice floes we also spot a pod of a dozen or so rare Beluga Whales, breaking the flat calm surface with their bulbous noses and pure white arching backs. 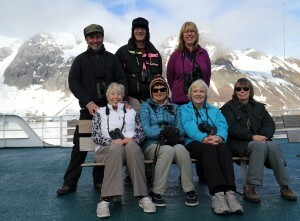 It’s really warm this afternoon as we go ashore on a gravelly moraine littered with crumbling whale bones for a wander along the coast, where we enjoy even better views of ‘our’ Belugas as well as a Minke Whale, Pink-footed Goose and a Sabine’s Gull! Even at midnight the sun is still quite high in the sky and shining bright, and so one great day merges into another. It’s another wonderfully calm mild morning as we anchor off Prins Karls Forland, an island to the west of Spitsbergen. We land on a long sandy beach inhabited by Purple Sandpipers, and further along, at least fifteen massive Walruses are hauled out in a heap, snorting, jostling and fidgeting as if wanting their own space yet too idle to move. Each one is a 1.5 ton mass of flabby blubber, making Sumo wrestlers look puny. Their loose fitting wrinkled skin ripples in waves each time they lollop to get a more comfortable position. Occasionally one sits up briefly and grunts before giving in to gravity and flopping down again. As we watch from a short way along the beach we can even smell them! Back on board ship, another Blue Whale appears just before lunch, along with a Great Skua, and in the afternoon, we land at Alkhornet, a massive pointed cliff towering upwards into the blue sky where the nesting Kittiwakes and Brünnich’s Guillemots are mere specks. Down below, the green slopes are grazed by numerous Reindeer, all unperturbed by our presence. 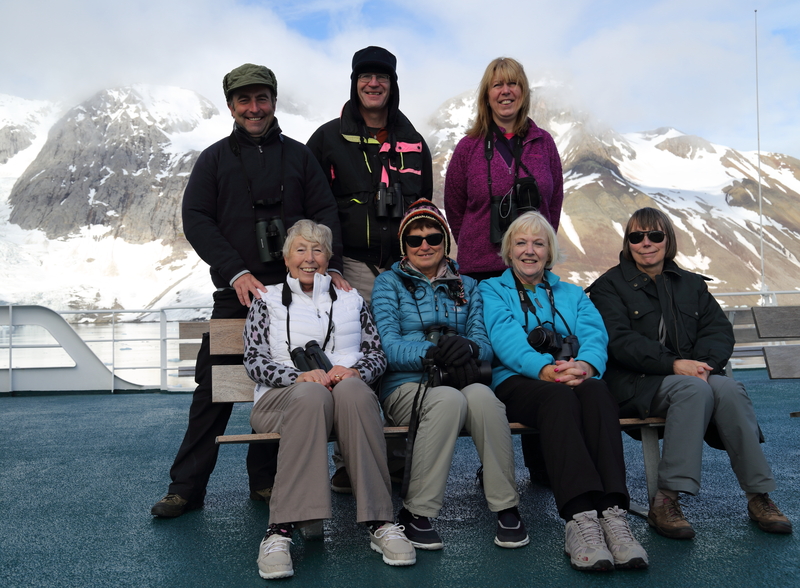 With a free morning back in Longyearbyen before the flight home we have time to visit the museum, and check out the shoreline where new sightings include a pair of Long-tailed Ducks and two majestic drake King Eiders, plus Ringed Plover and Great Black-backed and Iceland Gulls. Svalbard is definitely ‘out of this world ‘, and thanks to a wonderful ship’s crew this has been an incredible ‘trip of a lifetime’, with fantastic memories of Reindeer, Arctic Fox, Bearded Seal, Walrus, Beluga and Blue Whales, some special birds, including delightful Little Auks, and of course, the Polar Bears, and all in absolutely spectacular scenery.